As the real estate market heats up yet again and Miami real estate buyers are scooping up property in Midtown, Brickell, and other close neighborhoods, it seems the race is on to get in on all of the opportunities. One of the neighborhoods on the rise is Edgewater. Previously a run down, unsafe part of Miami, Edgewater seems to be the target for a lot of investors and developers as more and more set their sights on this up and coming part of Miami situated along Biscayne Bay. Because of this, several condominiums are under construction or in the planning stages in addition to those built over the past several years. 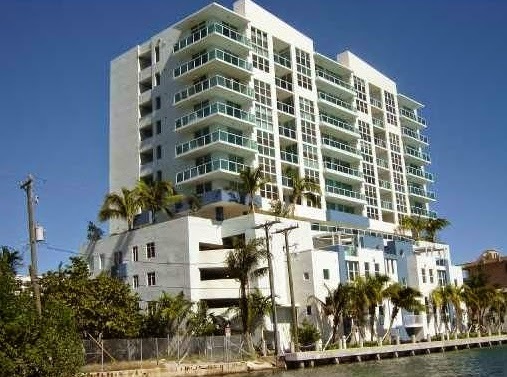 Bay House Condominium, 600 NE 27th Street. Planned for completion in Fall 2015, this MELO development is situated just a couple of blocks from Icon Bay. It features 38 floors consisting of (168) two and three-bedrooms units with panoramic Bay and city views. Some of the highlights include seven-foot wide private terraces, energy efficient, tinted, impact resistant, floor-to-ceiling sliding glass doors and windows, “smart building” pre-wiring with fiber optics for high speed internet, data/voice cable TV access, Italian cabinetry in kitchens and bathrooms, and imported stone counter tops . Building amenities planned include a spacious pool deck, business center, fully-equipped state of the art fitness center, 24-hour valet parking and attended security services, children’s play room, private and semi-private high-speed elevators and so much more. List prices start in the low-$500s and climb into the upper-$800s to low-$900s. 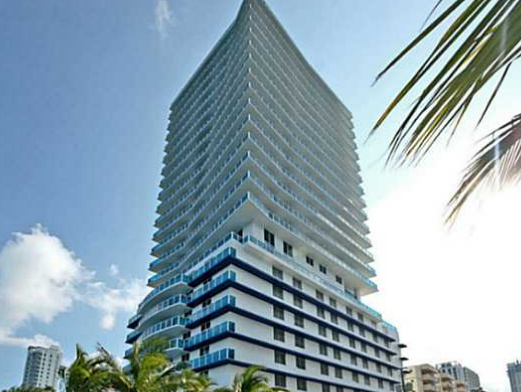 Moon Bay Condominium, 520 NE 29th Street. Built in 2007, Moon Bay sits just one block from Icon Bay also on the Bayfront. Originally, part of Midtown, Moon Bay is a boutique condominium with only 61residences on 12 floors. Amazingly enough there are a whopping eight floor plans for the relatively small number of units which range from 700 to just under 1,200 square feet and house one and two bedrooms. The kitchens are large and have a European style with granite counter tops and backsplashes stainless steel appliances and sleek cabinetry. On top of this, units are high speed internet and cable ready and have state of the art bathroom fixtures and marble vanities. Best of all, the large balconies feature beautiful views unique to Miami. Residents have access to a nice club room, fully-equipped fitness center, and a lanai pool deck and swimming pool with a very tropical feel. Because it is such a small building compared to its neighbors, there are typically very few properties for sale with only two listings to date with list prices in the high-$200s to low-$300s. It is ideal for first-time buyers and those buyers who work in close by neighborhoods but want to somewhat escape the excitement and action for which Miami is known. Crimson Waterfront Residence, 527, NE 27th Street. Another condominium under construction just a block from Icon Bay is Crimson Waterfront Residences. 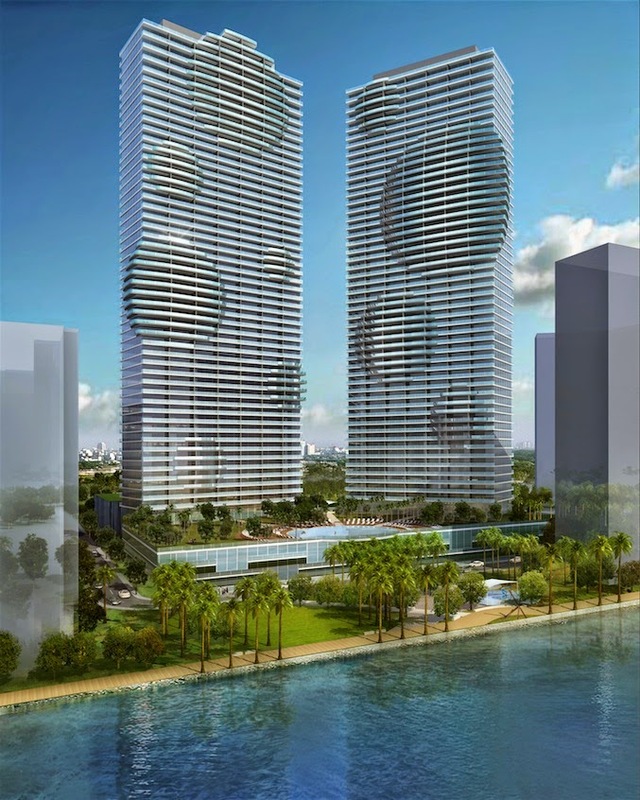 Tentatively slated to be completed in early 2015, this Bayfront condominium has a very contemporary style that complements its neighbors and appeals to a broad range of buyers. The plans call for the LEED certified building to house 90 units on 18 floors ranging in size from 829 square feet for one-bedroom units to over 2,200 square feet for upper level penthouses. Residences are open and airy with ceiling heights between 9’4” and 11’4” and additional features like spacious terraces, lovely kitchens with glass tile backsplashes, Italian cabinetry, and high-end stainless steel appliances, spacious closets and beautiful unobstructed water views to the bay and spectacular city views. As for building amenities, embracing the bay breezes is at the forefront with an 8th floor resort-style pool deck with panoramic views of Biscayne Bay as well as direct bay front boardwalk access and an exquisitely landscaped 20,000 square foot gated park. Other amenities include an outdoor barbeque area, water features throughout the building, park and Bay, fully-equipped, state-of-the-art fitness center and yoga studio, private movie theatre, and so much more. Pricing at Crimson starts in the mid to upper-$300s for one-bedroom units and climb to about $1 million for a three-bedroom penthouse. Reservations are now underway with only 20 percent down; closing expected in late first quarter 2015. Star Lofts, 700 NE 25th Street. Star Lofts is another condominium that falls within the Edgewater neighborhood borders. As a loft-style condominium, there are 47 units on 25 floors (up to only three units per floor) with tons of space and beautiful bay views. Each unit the features include designer fixtures, exposed pipes, flooring and other loft-style finishes. The kitchens are spacious and have granite counter tops, stainless steel appliances, and sleek, contemporary-styled cabinetry while the baths are fresh and modern with ceramic and marble flooring and vanities as well as stylish fixtures. At Star Lofts, there are several listings with prices between the upper-$200s and over $2 million. Since the beginning of the year, only two units have sold at Star Lofts. Units tend to stay on the market longer. 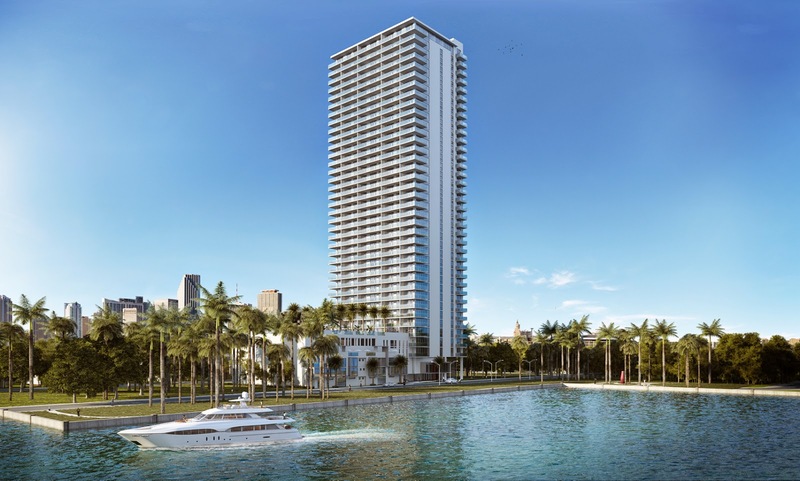 It is a different kind of condominium that attracts a certain buyer but with Edgewater’s revitalization, this is definitely a condominium that deserves a second look. 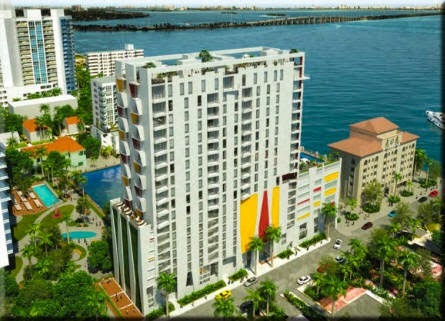 Paraiso Bay, 600 NE 31st Street. This is one of the most anticipated projects in the Edgewater neighborhood. Even though construction has begun for this mega-project from the Related Group and Arquitectonica, Paraiso Bay's completion is not expected until sometime in late 2016/early 2017. Plans show two 55-story towers with 700 units between the two buildings and only seven units per floor. In terms of bedrooms, there are slated to be two, three, and four bedroom units plus penthouses. Probably the most appealing feature is that each residence faces in the east-west direction so that everyone can enjoy city and bay views not to mention the gourmet kitchens and large terraces that make the amazing views that much more enticing. Building amenities a marina for watersports and boat docking, pool side cabanas and a café, the Acqua Club, a wine cellar with tasting salon and a cigar lounge with private humidors for residents, state-of-the-art fitness center and more. Since we featured Paraiso Bay in a blog last year, list prices have changed to start in the mid to upper-$500s. With so many new developments coming to Edgewater, it is very evident that real estate is on the rise. For those who missed buying at Icon Bay, don’t fret – look at these other options as well as the others that are under construction or slated to begin. Edgewater is quickly becoming THE place to live in Miami. I am very thankful to the author to write this fruitful information.I found this post to be very informative and helpful. I will have to recommend you to my friends.